Cherries and peaches are piled high at the fruttivendolo, warm nights are orchestrated by nightingales, pierced by the lone cry of a fox, and fireflies seem to bring the stars dancing in front of your eyes - it's summer again in the Marche. The small mountain fastness of Apecchio in the northern Marche boasts two award-winning artisan breweries and the town now styles itself la città della birra. Two food festivals, or sagre, from the scores taking place this summer across the region. In the far north the Festa del Prosciutto celebrates the remarkably good cured ham from Carpegna from 17 to 19 July, while in the south the village of Campofilone will be hanging out the flags from 7 to 10 August in honour of the local egg pasta, or Maccheroncini, famous across Italy for their subtle texture and flavour. Extra bunting this year for the prestigious white truffle fair at Acqualagna in Pesaro & Urbino province as it celebrates its 50th birthday. The annual Fiera Nazionale del Tartufo di Acqualagna starts a week earlier this year and takes place on 25 and 31 October, 1,7,8,14 and 15 November. 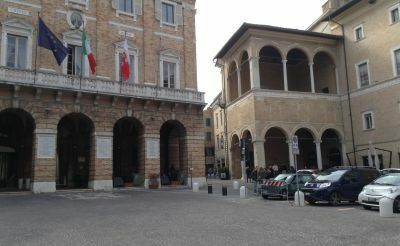 This summer's image of one of the region's piazze features Piazza della Libertà in Macerata, with the gracile arches of the Loggia dei Mercanti to the right. Australian musicians Michelle Urquhart (viola) and Keith Mitchell (piano) will be on tour in Italy performing works by, amongst others, Brahms, Franck and Paganini, and three of their five dates in early July are in the Marche. No need to worry about the weather forecast if you come to Pesaro this July and August. The local council will give you a free weekend, to be taken in September, or May and June next year, if you get caught in three consecutive rainy days. And if you need a reason to visit Pesaro, this summer sees the return of the weekly tours to Villa Imperiale, a very remarkable Renaissance villa and garden in the hills above the town. Until 30 September guided tours have been organized, including a bus ride from the centre of Pesaro, every Wednesday afternoon. Last year, when a large section of the road collapsed within the Furlo Gorge in the northern Marche, the spectacular pass was closed to motor vehicles. Now, sadly, the whole gorge has also been closed to pedestrians following a major rock fall at the eastern end. However, arriving from the western end, the beautiful romanesque church of San Vincenzo and the village of Furlo is still visitable, and the strada panoramica will take you up for breathtaking views of the gorge. Works to reopen the gorge are in hand - we'll keep you posted. The Marche is now Italy's third region for the number of "Blue Flags" denoting good-quality beaches; Liguria has the most Blue Flag beaches this year with a total of 23, followed by Tuscany with 18 and Marche with 17. The Marche shares its borders with five other Italian regions - Emilia-Romagna, Tuscany, Umbria, Lazio, Abruzzo - and the tiny Republic of San Marino.